Please refer to our stock # 4309 when inquiring. 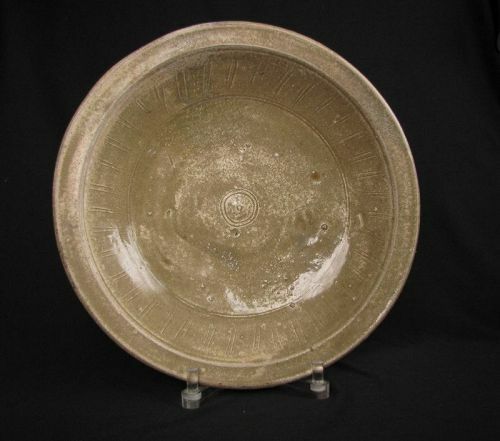 Large pale green glazed plate with incised decoration, most likely from the Thantwe kiln near present day Rangoon, Burma. Excavated from the Tak Burial site near, Mae Sot along the Thai/Burmese border. This can be reliably dated to least 14th/16th centuries due to other known and datable ceramics from China and Thailand that were found in the same strata. There does not appear to be any cracks or breakage but there has been some restoration to glaze that has completely fritted off noted in last two enlargements. D: 30cm/11.8in and H: 6cm/2.3in.